I have been using my spare time recently to steal away to work on a few little watercolor paintings. 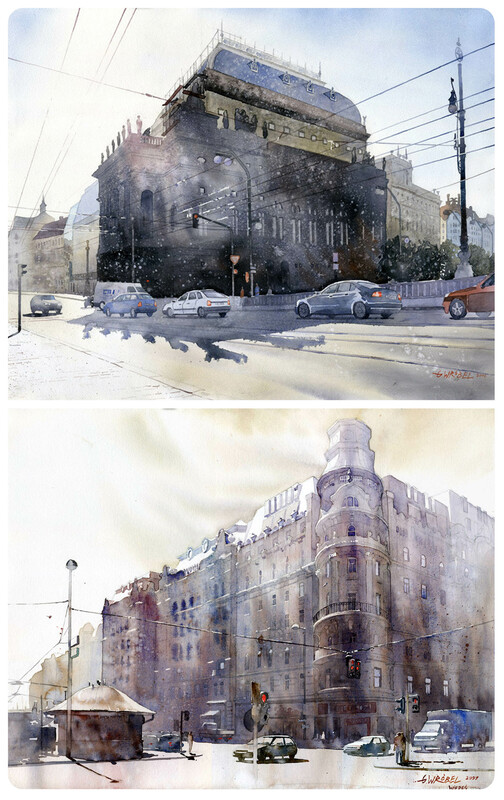 When I stumbled upon the work of Polish artist and architect, Grzegorz Wróbel, I was completely inspired. His use of simple shades with complex detail is so beautiful. I love the way he uses water and watercolor paints to turn an ordinary street into a mystical and intriguing scene. So beautiful. Look closely at the paintings. Even if you’re not a watercolor painter you’ll be able to see how much skill and planning goes into each of these. Grzegorz Wróbel even has a step by step example of his work, so you can see the whole process. So cool. Can you tell I’m a fan? These are exquisitely beautiful watercolor paintings! Wow. Just stumbled upon your blog. Its wonderful. Love finding new blogs to read! Really beautiful artwork. His painting and the effects he makes with the watercolors are stunning. Thanks for sharing and congrats on being freshly pressed! Love these paintings! Thanks for sharing. Very very Nice work ……….. Absolutely beautiful!! Thanks for sharing. Wow, your ability to capture both lighting and form so well with such a difficult medium like watercolor is amazing. Really lovely. Soft sanity. What a wonderful eye to first see it that way and then enable me see it too. Thank you for the presentation. His work is truly appreciated. Stunning, really. It really explained your logic of using simple shades to create complex details (which is simpler with water colour than oil, by the way). And I like the rendering. Really cool. Love the post…Great paintings. Thanks for posting. They are absolutely beautiful, gorgeous, and capture such a tone. wow they are just beautiful! They have so much emotion. Congrats on being selected for Freshly Pressed. Your blog site with WordPress is beautifully laid out. I attended the School of Art and Design (then called the School of Industrial Art) in the late 50’s in New York City. One of my art teachers was by the name of Routhbaum. She was an awesome water colorist, beside being the Assistant Principle of this School. Within two minutes she could paint the perfect portrait of anyone with simple water colors. I think of her often and the love of her work, as well as her students. That’s amazing! Do you know mind telling me her name? I would love to look up her work. Talented watercolor artist are so inspiring. Sadly I cannot recall her first name. She cryed in front of her class when I signed out of class to leave school at 17 and join the Air Force. I was an honor student with a made scholarship to Pratt Institude in New York. Living as a kid in Harlem, just got too dangerous for me. Wow. I’ve never been so amazed by the use of watercolors. Thanks. wow. amazing works of art! i can’t believe those are watercolor pieces. thanks for sharing! Amazing… and a fantastic advocate of the use of watercolour. Congrats! WOW. WHAT SUCH WONDERFUL ART WORK. I can see the reasons why you are attracted to this artist-designer’s work. Wow! What great work. I love the detail too, usually you don’t see much detail in watercolor paintings. these have taken my breath away.. the detail, the light, the air, the movement. thanks for sharing! These are gorgeous! I’m not big on watercolours, but more so of an acrylic/oil kind artist. However, these beautiful paintings makes me want to pick up watercolours again! Thanks for the share! Thanks for introducing me to Wrobel. Beautiful work. This is really beautiful work. So detailed. An inspiration! Just teriffic! The NYC/taxi piece has a bright, early morning feel to it. Great work! This is indeed beautiful! Every piece has such a great lighting they look they shimmer in light. great pieces of art. thanx for sharing and congrats for being freshly pressed. beautiful watercolor.. i must say this. the first one is the best. thank you for sharing those beautiful paintings. Nice watercolours – they evoke a strong sense of nostalgia and whimsy. I’ve bookmarked Wrobel’s website for future reference. I always love watercolor even if I’m not really good at it. But when I saw your works, I just love watercolor more! Such a great work! I love this work, thanks for sharing. The detail in your artwork makes them seem almost like misty photographs. Thank you so much for sharing your work! I’m a fan! Thank you for sharing. Those paintings are magnificent artwork. Beautiful artwork! Thanks for sharing your find with us. NIce work!! those pictures are from Poland? , I live in Poland and some of the places remind me to Warsaw. Amazing! you have real talent. Absolutely stunning! I love cityscapes anyway, but these are amazing. I to się nazywa sztuka, a nie jakieś psedo rzuty farbą które nazywają coniektórzy sztuką. BRAWO! Glorious watercolor paintings! . . . Can see why you’re a fan!! I am all about link love! Fell free! I’ve never really been a fan of watercolor, but these paintings are spectacular! I love how detailed they are. It’s been forever and a day since I’ve done watercolor, high school actually. These are gorgeous! My favorite is the church on a snowy hill. The most beautiful work I’ve ever visited on wordpress. Wow, what a compliment. Thank you so much! This is so fantastic. Honey for one’s eyes. Very pleasing and calming. His choice of colours is very inspiring. Mixing warm colours with cooler ones can be very risky but Grzegorz Wroblewski has done it extraordinary well. I can see a whole load of emotion in his brush strokes and like I said before, his choice of colours makes the viewer very calm. Using a wet brush is also hard but as I’m sure that we can all see that he has mastered this technique! His art is moving and has everything that it should have! Woaw this guy is a master! thanks for posting! wow I absolutely adore the shadow from the trees, overall just some superb work! I’ve never seen anything like that before. Simply STUNNING! Ooo! Thanks for the recommendation! I’ll look him up! Wow, so cool, I like the colors a lot, very subtle but intriguing. these are amazing paintings, keep it up! You’ve converted me. I love his work. I think my favorite is the first one of the wet looking street. I like them, I really do, but the whole work it’ so detailed, like photos. Photography and painting are not the same thing. I believe that a great watercolorist can give that difference. Check this link below and look the watercolor with the church at the left side. Can you see the deferense? That place exists, I ‘ve been there. There are better examples of that but I can’t find a link .. Anyway, Grzegorz Wróbel knows how to bring an image on the paper but he doesn’t know how to give his personal view. Truly amazing – thank you for such beautiful inspiration. What gorgeous pictures. Thank you for making this painter known to me – I’ve never heard of him before. I love this showcase! Thank you for posting this. These are simply amazing. Enjoy! What a lovely, almost photographic style. Good Morning. Thank you so much for bring Mr. Wrobel to our attention. Watercolor has always been my favorite medium and his work so clearly demonstrates why. It’s translucency and sense of looking at the world after a rainstorm has freshly washed the world.This is precisely the feeling I get with Mr. Wrobel’s work. Thank you for sharing this with us. Interesting – hugely popular! Are these paintings of photographs of places? Wonderful watercolours! Now there’s something to strive towards! These are wonderful, some of the best watercolours I’ve seen. These are spectacular! Thank you for sharing them! Amazing paintings! I have looked at these painting several times over the past few days, and I’m constantly amazing at how well he captures the color and lighting in a scene. So gorgeous! Those are amazing. Makes me want to break out my watercolors. Wow, these are so stunning! Watercolor is incredibly difficult. I’m still blown away by the third picture. These are beautiful paintings– so realistic, yet still obviously watercolor. that snow, trees, shadows of the trees are amazing……………. Those are some fantastic water colors! Must take you hours and hours to get this right. I especially like the one with the blurry shadows from the trees. Truly great stuff!! these are spectacular. simply stunning. Greetings from Carolina! I’m bored at work so I decided to check out your website on my iphone during lunch break. I enjoy the info you provide here and can’t wait to take a look when I get home. I’m shocked at how quick your blog loaded on my mobile .. I’m not even using WIFI, just 3G .. Anyways, very good blog!